Centered around lively College Street, Toronto’s Little Italy neighbourhood is one of the most vibrant areas of the city. Here we run through our top 10 picks of the most authentic Italian restaurants located here, plus a few other cuisines nestled in nearby. A slick version of a welcoming family-run trattoria, Marinella serves authentic Italian food in a warm, casual environment. Made from locally-sourced ingredients, their menu concentrates on the classics like risottos, pizza and handmade pasta, all delivered with a personal touch. With a beautiful, sun-drenched patio, this place is perfect for a leisurely meal with family or friends. A traditional Italian restaurant with a small cluster of tables outside on the street, La Forchetta is located right in the heart of Little Italy. The seasonally-influenced menu features a good number of freshly-made pasta dishes, as well as a few meat and fish options. The place’s passion for classic cookery techniques translates into the dishes, in small touches such as the high quality Carnaroli rice that gives their risottos a truly authentic feel. A romantic spot perfect for date night or a special occasion is Trattoria Giancarlo, a softly-lit restaurant serving rustic Italian food. Run by the same chef for over the 30 years, the kitchen produces a small selection of upscale classics, with no margarita pizza in sight. If you have room after your pasta dish or entrée, make sure to save room for dessert or a scoop of their delicious gelato, made in-house. Run by a father and son duo, Il Gatto Nero prides itself on its welcoming, family atmosphere. The simple, compact menu is full of traditional pizza and pasta favorites, with familiar flavour combinations delivered in tasty and generous portions. The honest quality of the establishment is complemented by attentive and accommodating staff, who will do their best to satisfy any special requests. Family-owned for almost 50 years, Café Diplomatico was inspired by the neighborhood haunts frequented by brothers Rocco and Paul Mastrangelo in their native Italy. 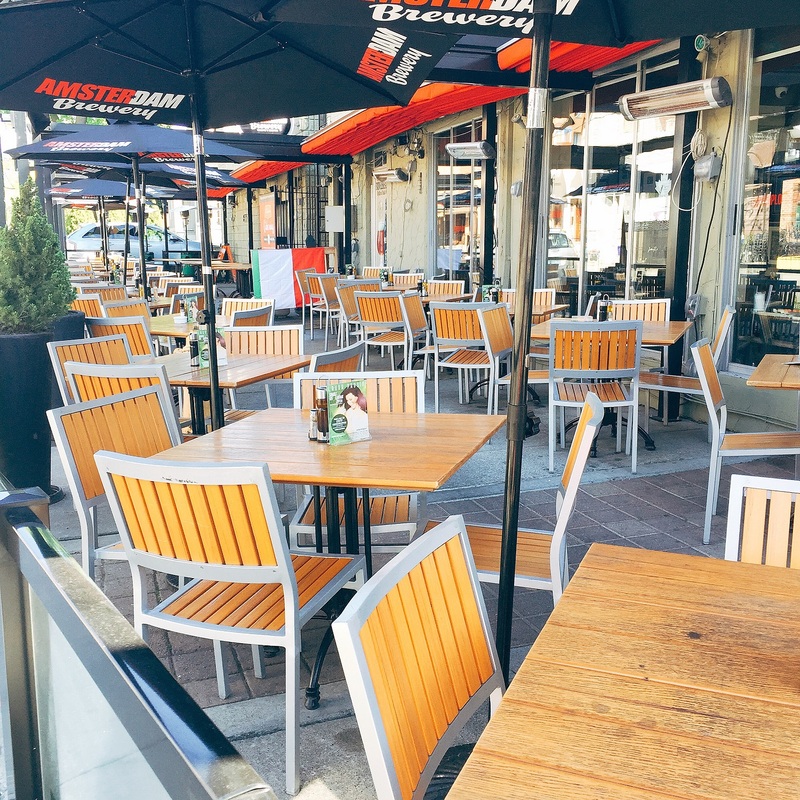 Affectionately known as ‘the dip’, the highlight of this friendly restaurant is the large outdoor patio, which was recently renovated with a smart new awning. The menu is very extensive with plenty of pasta and pizza options, most of which are based around the create-your-own idea. A more casual Italian joint is Hey Meatball, a which serves easily the best meatball sandwich in the city. There are now two of these places in Toronto’s downtown area, but their original Little Italy location is still the most popular, attracting an almost constant line out the door. Opt for a signature sandwich or go for their fill-in-the-gap type prompt, inviting you to choose your type of meat, sauce and side from a variety of options. If you’re looking for a great non-Italian option in the neighborhood, Bar Isabel is a tapas bar inspired by the chef’s time in northern Europe. The sharing style menu makes this a great place to come with group, as you get to sample a variety of the different small plates on the menu. Following the restaurant’s philosophy (‘eat, drink – and be merry’) there is an extensive drinks list to accompany your selection of cheese or cured meats. A Spanish-inspired restaurant in the area is La Carnita; the place to go for Mexican street food and small plates. With a cool laid back vibe, this place can be very busy, especially at weekends, but is always worth it for its delicious tacos and lively atmosphere. Piled high with fillings, the star attraction tacos come in six different varieties, from beef cheek with lime avocado and green cabbage to crispy cotija cheese with cauliflower, pinto beans and pickled carrots. A more contemporary take on Italian fare is Sidecar, which serves a Canadian-fusion style of European cuisine. The Mains feature a few nods to Italian classics, such as braised rabbit papperdelle and seafood linguine, whilst also capitalizing on great local ingredients through dishes such as the Ontario pork chop with grilled pear and roasted parsnip mash. The decor is similarly modern, with a brick-walled interior and popular rear patio. For the best authentic wood-fired pizza in Little Italy, try Vivoli, a slick version of a neighborhood favorite. Despite its outdoor patio, the place looks rather unassuming from the outside, but in fact serves great quality food in a relaxed atmosphere. The menu has plenty of choice and also offers some gluten free and vegetarian options.